What I love about the new year is the opportunity to start over. 2017 is our chance to start out right. I know I have struggled with my weight over the years and 2017 is the year I am going to work to make the changes I have talked about. There are tangible things I can do to improve my Health and Wellness. How about you? Are you thinking of positive changes you can make in 2017? Starting this January 2017, I have decided to focus on my health. Yes I want to lose weight but it is so much more than that. I want to eat right, exercise and feel good about the changes I am making. That is why I won’t be doing a diet that is not good for my health or my bone health. I have done the diets in the past where I ate a very low calorie diet just to break bones repeatedly because I was not eating right and not getting enough calcium in my diet. I also am not going to do the Atkins Diet where I had lost over 100 pounds at one point, just to quickly gain it back as soon as I ate something that was not on the approved plan like a piece of Birthday Cake on my birthday. want to be able to go on cruises, go out to lunch with friends and enjoy life. That is why I like the Beyond Wellness Shake. 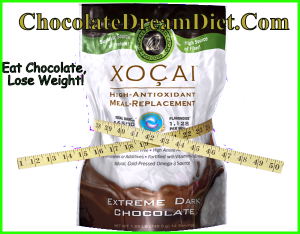 This protein shake is 21 grams of whey protein isolate and over 56,000 ORACfn antioxidants and lots of flavonoids. If you want to make minor changes, just incorporating this shake as your breakfast routine could make a huge difference. If you need to make major changes, like losing a significant amount of weight, the Beyond Healthy Chocolate Weight Loss Plan may be just what you need. I will be following the weight loss plan that was featured on the cover of the Bariatrician, the American Journal Of Bariatric Medicine. The Beyond Wellness Shake was featured along with the study that showed an average weight loss of 31 pounds in just 12 weeks and over 5 inches lost in the waist as well! Exercise of 20 minutes a day or walk 10,000 steps. Set a goal to do something, anything. Walking is fine. These are all obtainable goals. In fact, I have been on the Beyond wellness shake for breakfast for years. This shake fills me up for about (4) four hours so it is easy to do and tastes good. The Beyond protein shake is based on Healthy Chocolate. In fact, Beyond Chocolate is the Healthiest Chocolate in the World. Every Diet Has A Dark Side, Ours Is Chocolate! Now is the time to order and get focused on your goals for January 2017. 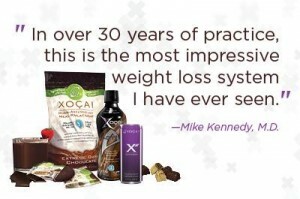 Don’t wait til the last minute, have your shake and Chocolates ready so you can get started when you want. Weekly calls are available to keep us all focused on the goal, renewed health and weight loss. Join us! Let’s all get fit together. Questions call Lynette or Wayne Henk of Three Sons Marketing LLC at 941-216-5727 or visit GoColdPressed.com for details on the shake and the weight loss study. If you are looking to do the full diet plan as in the original study, you will want to have (4) four bags of the protein shake to cover 2 meals a day for a month. Our weight loss program will go for 12 weeks just like the original study. Those who wish to go on beyond the 12 weeks will continue on with weekly support and calls. Associate Weight Loss Pack offers (6) Six bags of the protein shake and the original Weight Loss Study CD for ongoing support. This includes (2) Two free bags-pay for just (4) Four! Awesome deal! For those who want to start with the modified plan of breakfast only, check out the Wellness pack for $169.95 that includes (2) Two bags of the protein shake, a 12 pack of the Xe Energy drink and a 25 Healthy Chocolate Nuggets small box of chocolates for snacks and cravings. 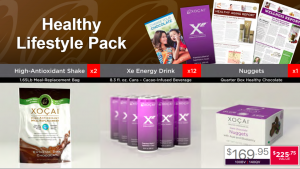 Another option for the full weight loss program is two of the Wellness packs if you would like the free Xe Energy and Nuggets that are included. Free recipes with lots of yummy shakes will keep you interested and focused on the goal. My favorite shake recipes are Creamy Peanut Butter Banana and Chocolate with Almond Milk. Both taste delicious and not what you would expect in a protein shake! Not sure what to do? Call us today! 941-216-5727. PreviousI Am Blessed To Have Found Healthy Dark Chocolate And It’s Benefits Are Shocking! NextSo Excited That Beyond Healthy Chocolate Has Arrived At The Embassy Suites Dallas Texas!